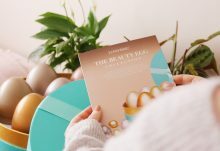 For this month’s Glossybox, there’s a rather nostalgic theme based around ‘taking you back’ through the decades and celebrating some of the big hits in the beauty world, by bringing a fresh and contemporary twist to some of the old classics. This homage to beauty sees styles from the 50s, 60s, 70s, 80s and 90s reinvented for the modern day. Interesting! 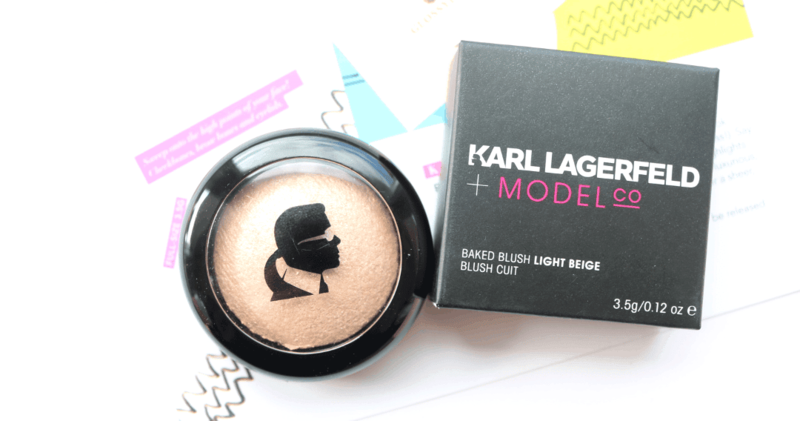 I’ve seen some hype about the upcoming Karl Lagerfeld collaboration with Model Co cosmetics, so I was thrilled to see one of their products in this month’s box, ahead of its official release date! Karl Lagerfeld has been a prominent fashion design throughout the decades and this baked blush represents a ‘catwalk-inspired glow’. The baked pressed powder formula is infused with micronized pigments to deliver a sheer, natural radiance that lasts all day. Very pretty and super easy to blend. Liquid lipsticks are a great way to wear a full coverage lip these days and this bold shade takes its inspiration from the 80s and 90s. 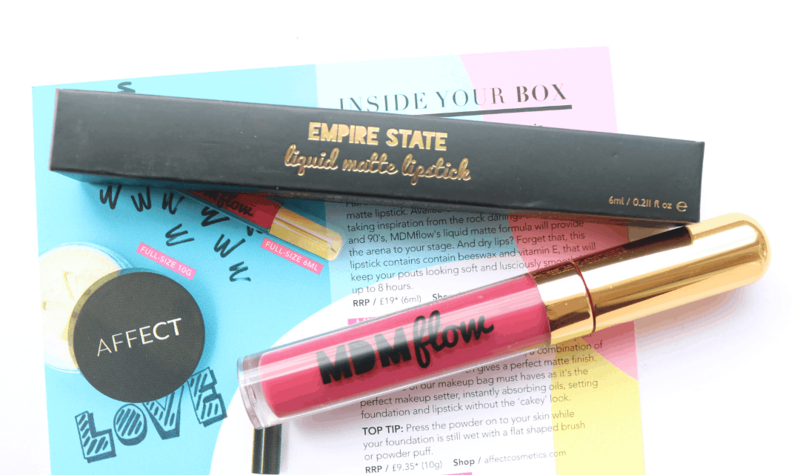 It has a formula which contains Beeswax and Vitamin E to help keep dry lips hydrated and smooth for up to 8 hours, and I love this colour called Empire State, which is a gorgeous bold and intense fuschia pink. Next up, there’s another full-size product, this time from Affect Cosmetics. 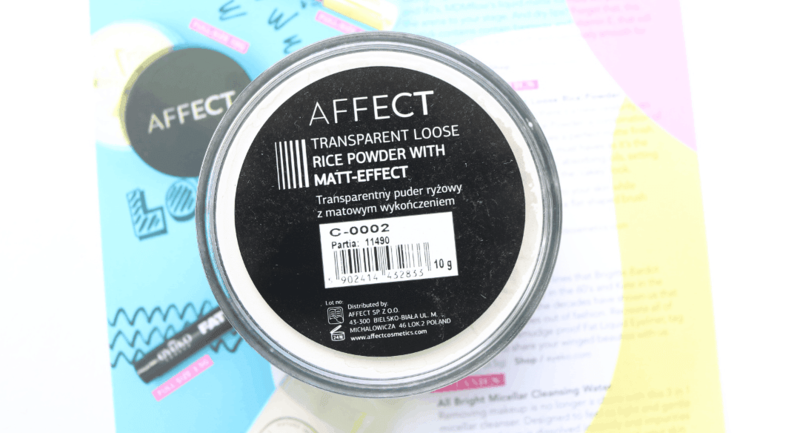 This Matte Effect Transparent Loose Rice Powder is a combination of Mica and Rice Starch which gives the skin a perfect matte finish. It’s the ideal make-up setter to use as it instantly absorbs any oils, sets foundation and concealer without altering the colour and doesn’t make your make-up look cakey. I’m looking forward to using this! Eyeliner has had many different trends throughout the decades including the big, bold lines of the 50s that were popularised by Bridget Bardot, the Twiggy looks in the 60s and Kate Moss’s cat-eyed flicks in the 90s – big eyeliner has never gone out of style! To help you achieve that coveted look, this Fat Eyeliner from Eyeko has a chunky marker pen style nib so you can easily draw on your lines and flicks, whilst ensuring everything stays puts throughout the day thanks to its smudge proof formula. Coming back to present day, the easiest way to now take off all your makeup before going to bed is with a clever micellar water. Just pour the solution onto a cotton pad, sweep all over the face and hey presto, your makeup is gone! 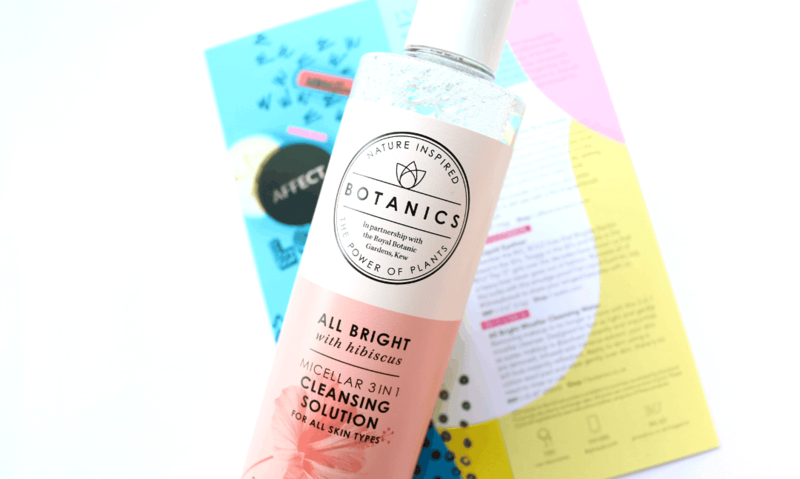 Botanics’s All Bright Micellar Cleansing Water is a 3-in-1 formula to gently cleanse, dissolve makeup and refresh your skin. It smells good and is another full-size product! 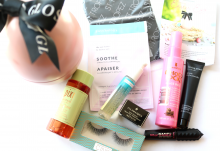 This month's Glossybox is a really great treat for makeup fans and will definitely please beauty lovers with FIVE full-size products!